DRACO Awarded Grant for BCS Dragon Boat Program! Posted on March 1, 2017 by Captain Bligh! DRACO is pleased to report that it has been awarded a $7,500 Service Grant by the Cancer League of Colorado, in support of its BCS dragon boat program. This grant will be used to provide a fully-outfitted boat that will enable Colorado survivors to enjoy the benefits of BCS dragon boat racing. Posted on August 21, 2016 by Captain Bligh! 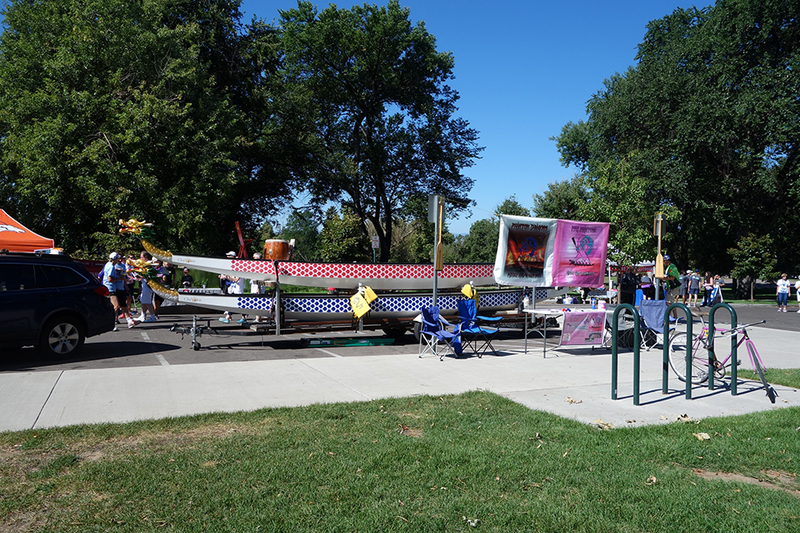 As part of its effort to promote its new Breast Cancer Survivor (BCS) Dragon Boat Program, DRACO had a dragon boat on display at this year’s Race 4 Research on Sunday, August 21, 2K16. The annual event was hosted by the Cancer League of Colorado, and is a major fund-raiser for that organization.